When you need a simple, easy-to-use option for finding the best personal loan choices, EasyLoanMatch is there to help. While relatively new to the field, the company has established a name for itself as an excellent loan aggregator and lender network. Despite some areas for improvement, EasyLoanMatch offers you a great way to compare loan options and discover the right credit product for your specific needs. It is important to note that EasyLoanMatch is not a direct lender, but a lending network that connects you to other loan providers. As such, it cannot set loan terms and conditions for any loan you see on their site. Once EasyLoanMatch connects you to your best personal loan option, your terms and repayment schedule will be agreed upon directly with your lender. Keep in mind that terms can vary according to the lender and depending on your creditworthiness. When you search for a loan with EasyLoanMatch, you have three possibilities. The three types of loan products include personal installments, peer-to-peer (P2P) loans, and bank personal loans. With bank and P2P personal loans, you can receive between $1,000 and $35,000. Personal installment loans offer a slightly more limited range between $1,000 and $20,000 for a loan. A major benefit of EasyLoanMatch is that because it is not a loan provider, there is no restriction as to what you can do with your funds once you receive them. Keep in mind that lenders within the network might have different qualification requirements, but those must be confirmed directly with the loan provider. 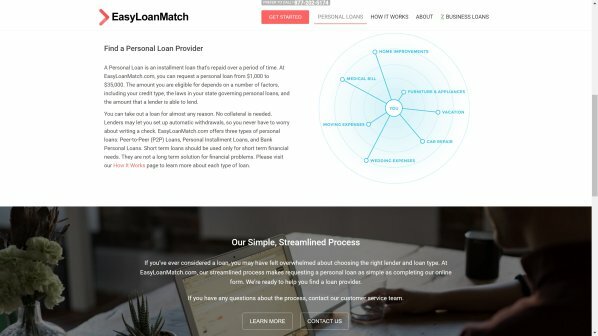 While we would have liked to see a broader range of loan amounts, EasyLoanMatch’s diversity of options more than compensates for the size shortcomings. In order to get approved, EasyLoanMatch requires some information to accurately match you to the best possible personal loan for your needs. When you are ready to apply for a loan, EasyLoanMatch asks for some basic information in order to help match you as accurately as possible. To qualify for a loan you will need to present your residency—you must be a US citizen or legal resident—proof of income, banking details, your credit score, and some personal details. With this information, you can be matched to a loan provider in less than three minutes. Our research found that while their matching technology is not as comprehensive as some of the industry leaders’, EasyLoanMatch’s quick application makes it a great choice if you need to find options for a personal loan in a short time. 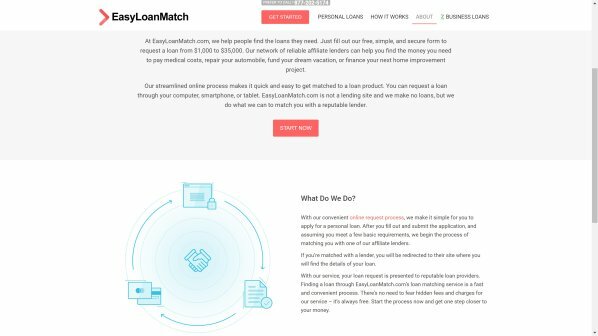 One of the areas we found that EasyLoanMatch could greatly improve is the amount of information they provide on their site. While the company’s main pages offer good introductory overviews of their service, there is no FAQ section—which has great value when making such an important decision—and very little information regarding personal loans themselves. It would be nice to see some more details regarding the process and their services in general. Applying for a quote through EasyLoanMatch is a simple process. While there are several pages you must complete before you are matched, the whole process is fairly brief and incredibly painless. EasyLoanMatch will ask for your basic personal and financial information in order to match you with the best borrowing options. You will have to provide details such as your credit score, your bank account details, and proof of employment. If you have all this on-hand, your application should take less than five minutes overall, with matching occurring as soon as you complete your forms. While it would be nice to see a condensed application, it is hard to find fault in a process that takes less than five minutes. Although there are some minor areas for improvement, EasyLoanMatch is a great option if you prefer to have several options before making a borrowing decision. While they are not a loan provider, the company’s vast network makes it a simple process to find the exact loan and terms you want or need. With a simple application, great variety in loan amounts, and a streamlined qualification process, EasyLoanMatch is an excellent choice when it comes to finding the right personal loan for your borrowing needs.